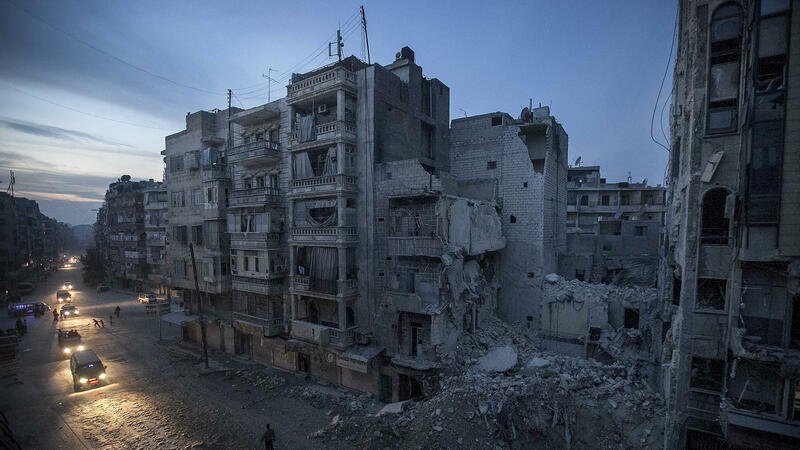 Night falls on a Syrian rebel-controlled area on Thursday, the same day an Internet blackout struck the country. The cause is still unclear, but many claim the Syrian government was responsible. First, it was Egypt. At the height of the protest against the Mubarak regime in 2011, authorities shut the Internet down. This week, it was Syria. Just as rebel forces there were making big gains, someone pulled the plug on the Internet, and Syria went dark. Service was restored on Saturday, but Andrew McLaughlin, former White House adviser on technology policy, expects we'll see more of this. "The pattern seems to be that governments that fear mass movements on the street have realized that they might want to be able to shut off all Internet communications in the country, and have started building the infrastructure that enables them to do that," McLaughlin says. The key to shutting down the Internet is building that infrastructure in such a way that the Internet service is provided by a government-owned company, subject to government orders. You could also have the service providers housed in facilities where the government could shut off the power. Technically, it's not hard. The whole idea of the global Internet has always been that it's an ungoverned space, where people around the world can share information freely. That principle will be challenged next week at the World Conference on International Telecommunications in Dubai. Among the agenda items at the conference is the notion that governments should have the right to control the Internet. "There are proposals on the table from certain nations that are actively calling for the right to be able to shut down their Internet infrastructure in the case of threats to national security or whatever," says Leslie Daigle, the chief technology officer at the Internet Society, an international nonprofit devoted to keeping the Internet open. Next week's meeting will be hosted by the International Telecommunications Union (ITU), a United Nations body that is pressing for a larger role in Internet governance. Andrew McLaughlin, the former White House adviser, said some authoritarian governments see the ITU as an ally. "The Russian government, for example, [is] asking the ITU to adopt new treaty language that would essentially bless its efforts to control the Internet for highly vague reasons like decency and territorial integrity," he said. Or, in cases like Syria, the control would be for security reasons. Daigle said what is at stake here is the principle of a global Internet, as opposed to separate national Internets that individual governments can manipulate. "We certainly fully respect the right of nations to protect their citizens," she said. "But, at the same time, I think that we wouldn't see the full potential of the Internet if we drive towards imposing national boundaries on the Internet." The last international telecommunications conference like this was held in 1988 — well before the modern Internet age. The uprisings in Syria and Egypt have shown how activists can mobilize and promote their cause over the Internet. Now, in response, some governments are now claiming the right to control Internet activity within their borders. It's an issue that will come up for debate next week at an international conference. NPR's Tom Gjelten reports. TOM GJELTEN, BYLINE: First, it was Egypt. At the height of the protest against the Mubarak regime in 2011, authorities shut the Internet down. This week, it was Syria. Just as rebel forces there were making big gains, someone pulled the plug. The Internet in Syria went dark. Andrew McLaughlin, until last year a White House adviser on technology policy, expects we'll see more of this. ANDREW MCLAUGHLIN: The pattern seems to be that governments that fear mass movements on the street or perhaps a military action have realized that they might want to be able to shut off all Internet and mobile phone communications in the country, and so have started building the infrastructure that enables them to do that. GJELTEN: The key to shutting down the Internet? Building that infrastructure in such a way that the Internet service is provided by a government company subject to government orders, or have the service providers housed in facilities where the government could shut off the power. Technically, it's not hard. It is controversial. The whole idea of the global Internet has always been that it's an ungoverned space, where people around the world can share information freely. But that principle will be challenged next week at the World Conference on International Telecommunications, being held in Dubai. Among the agenda items at the conference is the notion that governments should have the right to control the Internet. Leslie Daigle is technology officer at the Internet Society, an international nonprofit devoted to keeping the Internet open. LESLIE DAIGLE: There are proposals on the table from certain nations that are actively calling for the right to be able to shut down their Internet infrastructure in the case of threats to national security or whatever. GJELTEN: Next week's meeting will be hosted by the International Telecommunications Union or ITU, a U.N. body that is pressing for a larger role in Internet governance. Andrew McLaughlin, the former White House adviser, says some authoritarian governments see the ITU as an ally. MCLAUGHLIN: Here we see the Russian government, for example, asking the ITU to adopt new treaty language that would essentially bless its efforts to control the Internet for highly vague reasons like decency and territorial integrity. GJELTEN: Or security, like in Syria. Leslie Daigle of the Internet Society says what is at stake here is the principle of a global Internet, as opposed to separate national Internets that governments can control. DAIGLE: We certainly fully respect the right of nations to protect their citizens, but at the same time, I think that we wouldn't see the full potential of the Internet if we drive towards imposing national boundaries on the Internet. GJELTEN: The last international telecommunications conference like this was held in 1988, well before the modern Internet age. Tom Gjelten, NPR News, Washington. Transcript provided by NPR, Copyright NPR.